Modern CBD bar - great value drinks and lunches. 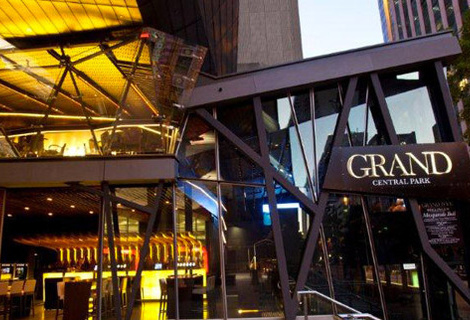 The Grand Central Bar and Restaurant was reviewed on Tuesday 26th March 2013 18:00 by Richard. A raft of new bars have shot up along St George's Terrace, in the heart of Perth's CBD in recent years and one of the newest kids on the block is Grand Central Park. Located at the foot of the Central Park tower, the huge glass panels and exposed supporting pillars give the place a very modern, upmarket look to it, matched on the interior with a huge backlit bar and a host of posh finishings around the joint. The place looks a bit domineering at a first glance and some might even say pretentious. I didn't find the atmosphere to be pretentious at all, it actually had quite a relaxed vibe to it but at the same time still retaining it's posh-ness. A mate and I popped into the Grand to take advantage of their $19 steak night available on Tuesdays. 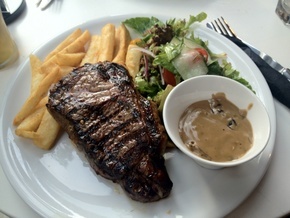 The deal sounded amazing at first glance, $19 for a steak and glass of shiraz. Turns out the deal is actually $19 for a steak OR glass of shiraz, never the less, a steak and sides (chips and salad) for $19 is damn good value these days. We ordered the steaks along with a few beers from the bar and picked a good spot in the elevated section overlooking St George's Terrace to sit down. Walking into the place I half expected that the staff were going to be a bit rude given it seems to be the trend at most upmarket bars in Perth. We were pleasantly surprised by the service from both the bar and wait staff, they were friendly and quite fast at pouring drinks, bringing out our food and clearing empty glasses/dishes. Our steaks came out within 15 minutes of ordering and looked great on the plate. There was a generous serving of chips on the plate and a small salad that you could actually eat, not just a bunch of token greens there for aesthetics. The steak was a good quality cut of meat and tasted quite good, the only problem was that both steaks were overcooked. We both ordered our steaks cooked medium, however they were a lot closer to well done than medium. One of my biggest peeves at a bar/restaurant is overcooked steak, simply because it's one of the easiest things in a kitchen to get right. 3 - 3.5 minutes on each side (for a reasonable thickness), let it rest for half the cooking time, boom! you have yourself a medium steak. That said the steak still tasted good and the tasty mushroom sauce did a fantastic job and making up for the lack of moisture as a result of overcooking. The chips and salad were both good too and saved the whole dish along with the reduced price tag given it was steak night. I'd definitely be willing to give Grand another go sometime down the track. The menu has a decent selection of both food and drinks (especially wine) and all very reasonably priced. Hopefully the overcooked steak was just a once off. Its as central as you can possibly want a bar to be in Perth's CBD so it's great for an afterwork drink on your way home or even a client lunch. 8/10The Trustee Bar & Restaurant in Perth, WA (48m away)A future Perth icon. 8/10Print Hall in Perth, WA (55m away)Massive inner city bar spread across 4 levels - great service and rooftop bar.